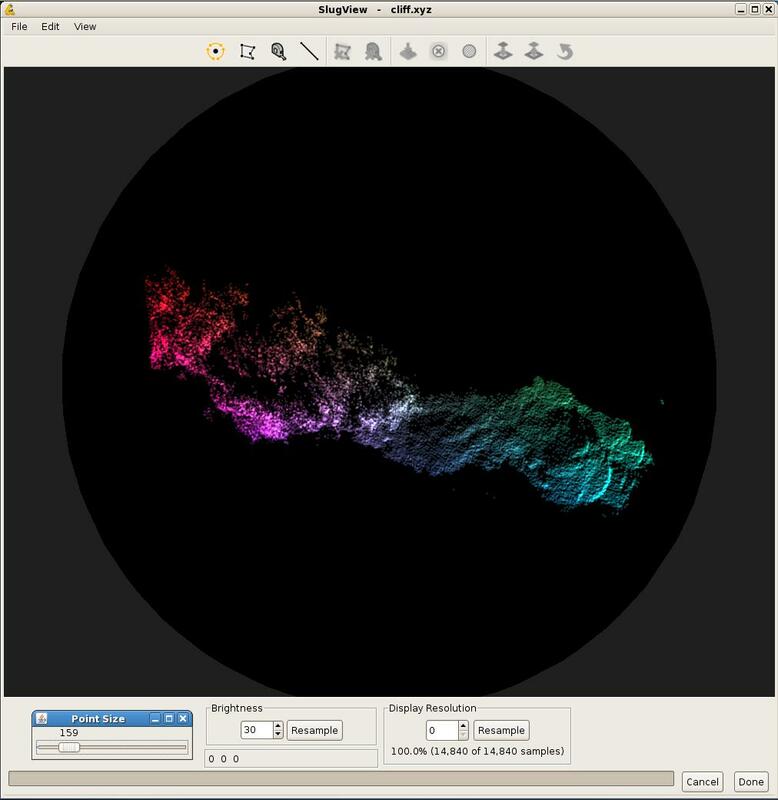 SlugView is a 3-Dimensional point-cloud visualization and editing tool. Contact: Lynne Newberry lynne@nevaridge.com. Feedback is encouraged. Please include "SlugView" in the title. Note: File must be saved, not just opened. More instructions are found in this pdf (names are out-of-date, but instructions are still valid). Added support so one SlugView program can drive the viewing geometry of others. Added keyboard support for controlling flickering. Added Messages window for reporting measurements and point cloud sizes. Fixed mouse-tracking mismatches on some displays. Documentation/manual now opens in desktop web browser. Added support for two new data columns which are retained, but not operated on. Fixed calculation of "average distance"
Added multi-selection. Right click to delete last selection. Use "cancel selection" button to remove all selections. Resolution is no longer reset after a deletion. Moved sv.ini from the installation directory to the user's home directory.